This workhorse pumps 1800 gallons of blood around your body every day! Print a diagram - Click on this link and then use the browser print command to produce the diagrams you will need to complete the tutorials. 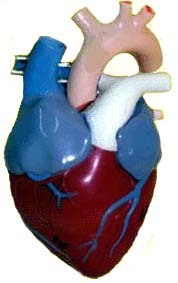 Student Tutorials - Click on these links to learn about the anatomy of the 4-chambered heart. Test Your Knowledge - Click on this link to test your new information about the heart. Write the answers to the test questions on the back of your diagram page.